Capital of the department of Var, France. There was a Jewish community here in the thirteenth century. The poet Isaac Gorni, who visited it in the beginning of the fourteenth century, complained bitterly of the rich Jews of Draguignan, who did not know enough to appreciate his talent. He called the place ("dragon's lair"). In 1350-1400 two Jews, Cresquet and Crescas, who had come from "Draguinham," lived at Tarascon. 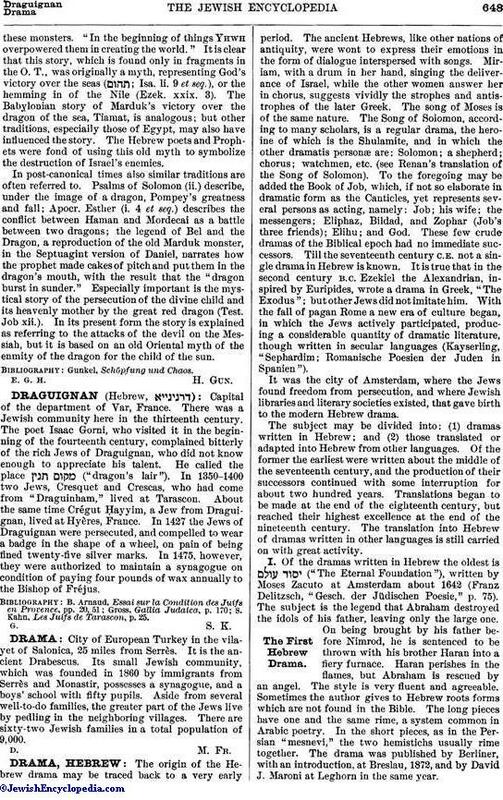 About the same time Crégut Ḥayyim, a Jew from Draguignan, lived at Hyères, France. In 1427 the Jews of Draguignan were persecuted, and compelled to wear a badge in the shape of a wheel, on pain of being fined twenty-five silver marks. In 1475, however, they were authorized to maintain a synagogue on condition of paying four pounds of wax annually to the Bishop of Fréjus. S. Kahn, Les Juifs de Tarascon, p. 25.